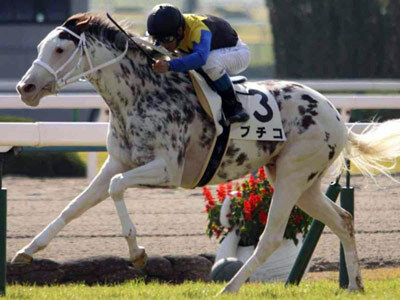 An unusually marked white thoroughbred mare is making quite an impression on race fans in Japan and around the world. Four-year-old mare Buchiko has won three races and been second twice from 11 starts. Registered as white, she has dark chestnut “medicine hat” markings on her head, and has jagged chestnut dapples or spots on her body, which many watchers have likened to appaloosa markings. Buchiko’s dam, the pure white mare Shirayukihime. However, she’s full thoroughbred, being by the Kingmambo sire King Kamehameha and out of the Sunday Silence mare Shirayukihime. It is from the pure white mare Shirayukihime that Buchiko gets her colouring, and she is her best performed offspring so far. She has been credited with drawing crowds back to the races, particularly female fans. Her white colouring is courtesy of a specific gene mutation, the KIT gene, which plays an important role in colour during embryonic development, causing an absence of melanocytes in depigmented skin areas. Buchiko is trained by Hidetaka Otonashi, the 61-year-old who has prepared many top-class horses in his career, including Grade 1 competitors Mikki Isle, Company and Lia Fail. Roughly translated from Japanese, Buchiko’s name means dappled girl. On racedays, her handlers wear spotted accessories to complete the picture. There’s also a range of Buchiko merchandise available, including badges, bags, keyrings, and pendants. Registered as white, Buchiko has almost dappled colouring on her body, and white legs.